There was an Asura (demon) named Narakasura, who was killed by Lord Krishna and, He smeared his forehead with the blood of Narakasura as a symbol of victory of good over bad. Lord came back home early morning on Narak Chaturdashi – where the blood from his fore head was washed away by the womenfolk and he was given bath by scented oil. The washing away of demon’s blood also signifies washing away of bad virtues and purifying our body and soul. Since then it is customary to take bath on early morning before sunrise on this day. Apart from cleansing of their bodies house holders also clean their houses on this very day to get rid of all the Naraka from their lives. 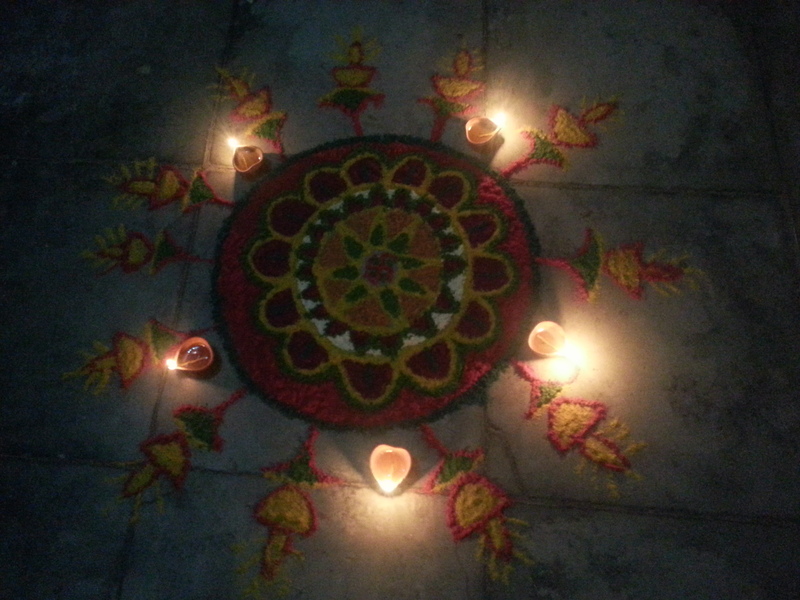 This day is also called Choti Diwali. Although it is said that marriage of Lord Vishnu and Lakshmi happens to be this day, but it is majorly celebrated as the return of Lord Rama from his 14 years of exile to his kingdom Ayodhya after defeating Ravana in Lanka. The happiness of his return to Ayodhya is reflected by bursting fire crackers & lighting lamps (Deeps). Deepawali itself literally means row of lamps. People wear new clothes and celebrate this day as the victory of good over bad. King Bali was an Asura – but a kind hearted and ambitious king. Once he performed a Yagna to please Lord Brahma. The Yagna was so huge that all the gods in heaven were afraid of such a huge sacrifice and they were worried if Bali became powerful to harm them after getting a boon from Lord Brahma. Worried and tensed gods then approached Lord Vishnu and requested him to check King Bali’s power before he get a boon from Lord Brahma. Lord then took the form of a dwarf Brahmin – also called Vamana Avatara, and then approached to King Bali in his Yagna. Meanwhile King Bali was very happy and quite pleased with the way his Yagna was getting successful. He was very generous during his sacrificial offerings and now was very sure of success of his Yagna. When he see a Dwarf Vamana – he asked him respectfully to ask for anything on that auspicious occasion which will be given. Lord Vishnu asked for just the land equal to his three steps, and then to everyone surprise he stretched his form as large as to cover the whole earth and whole sku from his first two steps. There was no more space left in the world for Bali to offer to Vamana for his third step. Then very gracefully he offered his head for the third step. Lord Vaaman put his feet on Bali’s head and then pushed him to the under world (patala loka). People of Bail’s Kingdom were not happy on these turn of events and looking at all this Lord allowed Bali to revisit his kingdom once a year that second day of Deepawali. People of Bali’s kingdom thereafter started waiting for Bali every year lighting lamps for his welcome. It is said that King Bali is one of the seven immortals in Hinduism who still walks on the face of the earth. He is also said to be the next Indra before the final communion with GOD.